Advanced internet audio distribution network. When you want to broadcast only inside your own LAN, listeners can connect directly to your Audiozender 2.0. Depending on the speed of your LAN and the configuration of the Audiozender 2.0, you can serve more than a thousand local listeners. But if you want your transmission to be heard worldwide, then a subscription to an internet distribution network is necessary. Audiozender.net is such a distribution network, which is especially affordable when you have irregular transmissions. Because for a fixed, very low monthly fee, you can, on any desired moment, broadcast to many hundreds of listeners at once. Worldwide. And if you often use more than several thousand listener-hours per month, we will gladly engage in talks to establish a corresponding service fee structure. 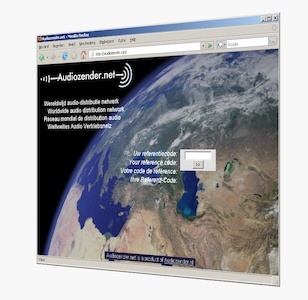 Audiozender.net is a unique distribution network, in the sense that your name is not listed in public, and your transmission times are not advertized. You are free to make such announcements on your own website, including a link by which listeners can directly receive your broadcast. Or you can send an access code to your users, with which they can access your transmission at exactly the right moment. Above all, Audiozender.net is a professional service partner. It is your transmission and your message that are all-important, and your listeners do not need to notice in any way that you selected Audiozender.net as your distribution network. We are keen to organize our services in such a way, that an optimal result will be obtained in your specific situation. The most important function of an audio distribution network is broadcasting your message directly to your listeners. But if you want to offer the opportunity to listen to your transmissions at a later time, Audiozender.net can save your transmissions and keep them available for a while. You can enter times and durations on your personal Audiozender.net webpage. Or, if you have the information already available in your own web platform, it can be re-used quite easily. Your saved transmissions will be available either via the Audiozender.net website, and/or via your own website. In various situations, alternative distribution networks are more suitable than Audiozender.net. In some cases, a distribution network is not needed at all. The Audiozender 2.0 devices can be deployed in all these situations, and also handling multiple distribution networks at once is easily possible. Several such situations are detailed on our Applications pages.